I'm happy with these curtain rods. The longer of the 2 I bought had a third pole but it wouldn't fit in the other 2 to make it stronger. Since I usually leave the curtain hung on these open, hopefully this won't be an issue. The smaller rod was perfect. The Topper decorative curtain rod and finial set features a simple, classic style and traditional design with a matte finish iron rod and coordinating iron button end cap finials. This set will provide a visually balanced appearance for your window treatments. The 1.6" diameter x 0.7" long finials will insure that your window curtain panels will remain securely on the rod. The 1" diameter iron adjustable curtain rod is designed to fit a wide range of window widths, and has a sturdy 25 lb. capacity that will support flowing sheers to thermal blackout panels. The 3.5" fixed depth projection bracket provides a gracious amount of space for fabrics to drape perfectly. Accommodates window curtain panels and drapes that are designed with various tops, including: rod pocket, pinch pleat, grommets, tab top, or hidden back tab top. Provides an attractive accent to every window treatment in your living room, bed room, bathroom, kitchen, and kids room. Installs easily with included hardware and installation instructions. Sturdy, easy clean, no fuss, wipe clean finish will last for lifetime. This window curtain rod and finial set will add the perfect finish accent to any window treatment and adds a refined style to your home decor. 1" iron, adjustable rod is capable of supporting heavier fabrics up to 25 lbs. Dimensions 66.0 In. X 1.0 In. X 1.0 In. These curtain rods work well in my space. Make sure to pick curtains that have the large grommet holes as these rods are wider diameter than many. I wanted ones with understated finials as one window goes almost to a corner and there isn't room for a large finial. The finials are not metal, they are a hard plastic resin. One finial was chipped when it arrived and the the finials are a different color on the inside. I colored it black like the rod with a sharpie and stuck that end in the corner where it won't be noticed. I hate throwing things out! Overall happy with the purchase and look, but wish it hadn't been chipped when it arrived. I just put these curtain rods up in my bedroom. I chose gunmetal and I’m so glad I did. It’s not as bold as the black and would coordinate with most decor. I purchased the small finial because of slanted ceilings. I will be back to purchase more when I redo a bedroom on the first floor. I highly recommend this curtain rod. This is a great curtain rod. 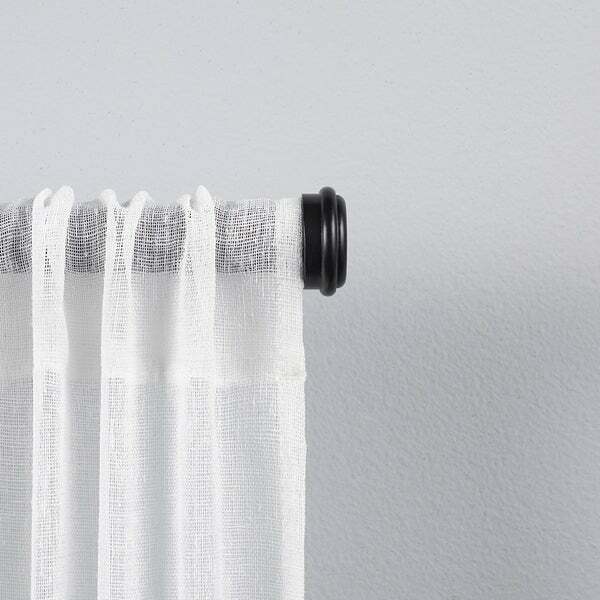 We installed it this week and absolutely love this curtain rod. It is simple and elegant. We will be ordering more for the rest of the house. This is exactly what we were looking for! Super simple to install...this is perfect size for diameter and also perfect length to cover my bedroom window. I'm going to purchase another one in a different color for another room! Great price as well! This is a newer purchase for me, i normally purchase different rod sets for my design projects but I love these. 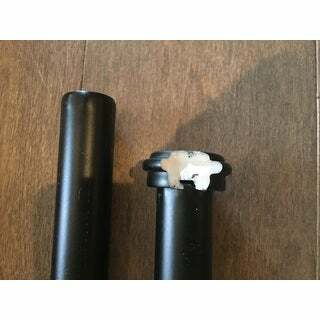 Finish and quality is great, will order again! Adjustable per the description. Clean lines and finish looks good. Will update review after installation, but for now it is exactly what I was looking for and at the right price. Very good quality and good looking rod, would recommend. Unfortunately this was shipped to me without a bracket. After contacting support, they sent me an entirely new package within the next day. Great customer support! Came scratched up in delivery but otherwise quality is good. Looks exactly like the picture. I’m very happy with it. When it comes to beautiful window treatments, curtains are just the tip of the iceberg. Adding curtain hardware or accessories, can add a whole other level of sophistication to your windows. We've narrowed it down to the seven most important curtain accessories for you to design a window treatment that'll wow your guests every time. Bay windows are built in a variety of shapes and sizes. Fortunately, there are several ways to hang your bay window treatments, each with different benefits to suit your preferences. Check out these options to find your perfect match.